When I think of banana cream pie, I am instantly transported back to 1991 and my high school cafeteria. Banana cream pie day was usually on Wednesdays, and I don’t think I’ve had a slice since those days, because I realized what went into the pie to make it “cream.” I have pretty much have stayed away since. Fast forward 20 years, and I devised a pretty easy banana cream pie fix that isn’t too bad for you and is an easy treat. The best part is you only need two ingredients. I pretty much always have frozen bananas on hand, and for some reason one day, I decided to add light coconut milk to my grocery order. It turns out, the two marry well when blended at high speeds. I hope you enjoy this idea! That sounds yummy. I have to try that. DELICIOUS! Just found a Vitamix at a garage sale and had to try this out! Incredibly good. Please keep posting recipes – and I’ll keep making them! Thanks again. Oh, Mary Ellen, you just made my day! 🙂 So glad you liked it. It’s a favorite of mine! I post new recipes whenever my hare-brained head thinks them up, so defintely drop by from time to time! And, lucky you for finding a Vita Mix at a garage sale! This is a great recipe. I tried the strawberry ice cream yesterday (I had to use frozen blueberries, peaches and strawberries since I didn’t have enough strawberries). I made this this morning so that it could freeze during the day. It’s delicious — hopefully I can resist eating it until my familly is home this evening! Yay! I’m glad you like it – it is probably my favorite Ninja blender recipe. It really is delicious! Enjoy! I’m going to make this and freeze in my popsicle mold for a nice banana creme pie dessert. It’ll definitely control portions so I don’t over do it. I already have everything i need…maybe ill mix a bit of graham cracker crumbs or something into it so you get the crust flavour as well. Tiffany, that is very smart! Enjoy! What an awesome website! This may sound a little dumb but do i have to use frozen bananas or can they be fresh and then freeze after blending in the ninja? I live in Hawaii and everything is pretty fresh out here. Thanks! How lucky for you to live in Hawai’i! I would freeze the bananas before blending so you can eat it sooner, but, I can’t see any reason why you couldn’t blend fresh bananas and then freeze to harden up if you have more time. If you do blend the fresh, please come back and tell me how it works for you! Well looks like it’s going to have to wait till next time. I put 3 fresh bananas, a bunch of strawberries and coconut milk in my ninja and blended. Then I added some ice and a scoop of vanilla ice cream to make it cold. It came out like a smoothy. So I kept blending it to make it as smooth as possible and put it in the freezer. It came out delicious but way too many steps and way too much time. Next time i’ll freeze then use the bananas. I’ll keep you posted. Thanks so much for this awesome website. As you can see i’m not the best cook but i know how to have a good time with my food..haha Mahalo! This racipe does not need any sugar ? Just made this one – YUM! Have you tried homemade coconut milk? I did homemade coconut milk in the Ninja a couple of days ago, and used that. Pretty easy! Thanks Denise, enjoy your Pulse. I certainly love mine! Thank you so much. I just got my Mega Ninja kitchen system in the mail last week. I am looking forward to trying this recipe because i have to use lactose free products. I miss having ice cream so i am very excited. Awesome that you got a Ninja Mega. I have been trying one out all week and love it! Enjoy the ice cream, it truly is a simple pleasure! I just bought a Mega System also and found your recipes. Will be bookmarking your pages and trying them out. 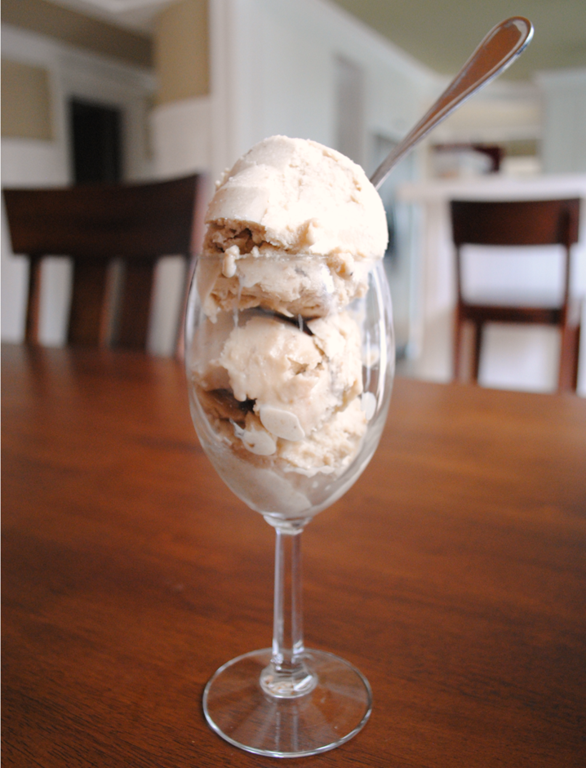 Always on the lookout for new idea and I make a banana gelato similar to this but with Frangelico, honey and a bit of salt…then top with hazelnuts and amaretti cookies. Really like your recipes and cannot wait to try them…and your step by steps are AWESOME! Just bought a Mega System also and looking for some great recipes. Will do the same as Paul and save this site. I did try to make apples juice for my little one but it didn’t turn out like they showed on the infomercial. Hope the icecream turns out as my little one wants it tonight. I also can’t wait to try the peanut butter, especially since our brand has gone up to over $12.00 for a jar. Love the interaction and feedback others are giving. Thanks for starting this post. Having a tough time making ice cream. The 1st time we made it, it was too runny so I figured we used too much liquid. so the next batch turned out ok. Tried making the chunky monkey but again runny plus the nuts and chocolate were not chunky! Lol Did I over blend? I have the mega kitchen. It sounds like you definitely have too much liquid, and could be potentially over-blending. What kind of liquid are you using? A thinner liquid (like skim milk) could be the culprit. I would say start with about 2/3 of the called for liquid, and see where that gets you. For the chunky monkey, you add the chocolate and nuts after you’ve already made the soft-serve, and just “pulse” them in — only a couple of pulses just to chop them up. I hope that helps – and sorry you’re having runny ice cream! add two whole graham crackers as the pièce de résistance! now it’s a pie! I saw a simple cheesecake recipe now can’t find it?? Hmm, it must have been on another site, as I don’t have a simple cheesecake recipe in my repertoire (yet). Sorry! I love short and sweet. Thank you for your note! Made this with frozen bananas! Better than high priced ice creams. Isn’t it? So simple and yet so good! My husband loves maple nut ice cream. Could you suggest ingredient to use with coconut milk? Daughter gave us a prof 1500 . Do you have a recipe book for senior citizens?? Thank you so much for so much help.